If you’ve done some homework and explored baby formulas by leading brands, you surely must have come across names such as Lebenswert and Hipp a few times. 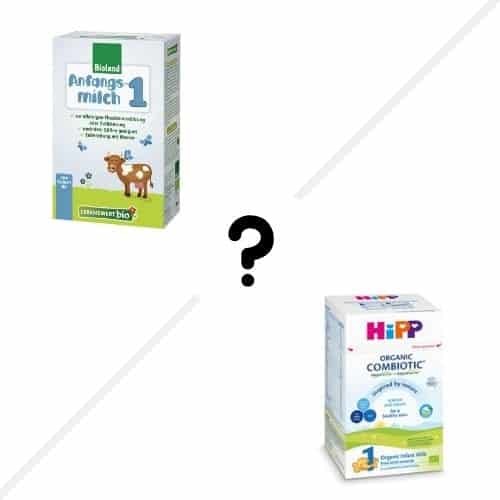 Here, we’ve put together a detailed Lebenswert vs. Hipp comparison to help you make an informed decision and pick the best infant formula for your baby. Both the infant formulas are currently not being sold in the U.S. and are available for purchase online through European distributors. As new moms, we fed our babies Lebenswert and Hipp baby formulas to test the products and make it convenient for you to pick the best one for your infant. Lebenswert and Hipp formulas are manufactured in Europe and contain superior-quality ingredients. Lebenswert is actually a product by Holle. Hipp is another popular baby food brand run by the Hipp family for over 100 years. Both brands stand up for sustainable values and ecological agriculture. 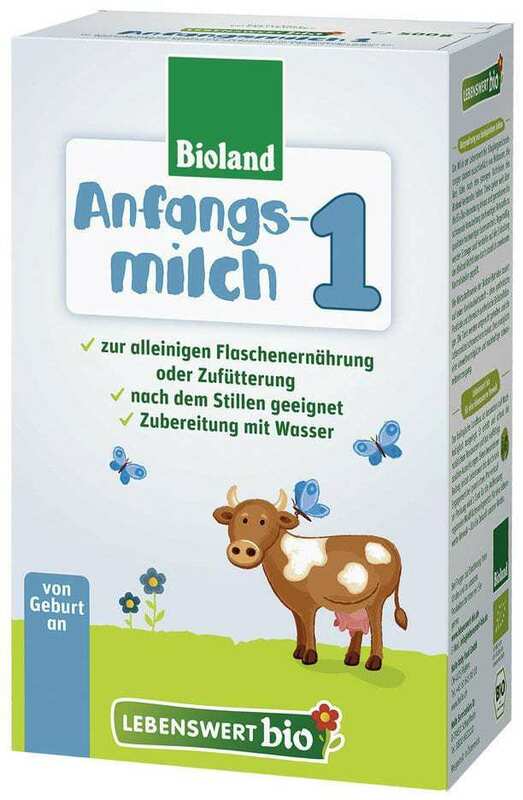 Moreover, both baby formulas are organic; however, Lebenswert formula is biodynamic. Hipp contains essential probiotics and special features to address infancy issues such as constipation, indigestion, bloating gastrointestinal reflux, and gas. These are just the basic difference and there’s a lot more you need to know about both product. Read further to check the in-depth Lebenswert vs. Hipp comparison. 7.1 Is Hipp formula hypoallergenic? 7.2 What is Combiotic formula milk? 7.3 Does Lebenswert formula contain maltodextrin? 7.4 How long can I store Lebenswert formula outside? 7.5 Can I add sugar to Lebenswert and Hipp baby formula? 7.6 What Does HiPP Stand For? While ARA and DHA are naturally found in breast milk, they’re added to infant formula by extracting fungus and algae using hexane which is a neurotoxic chemical compound and harmful for your baby. Make sure the baby formula does not contain processed refine sugars such as maltodextrin, sugar syrup, corn syrup, or brown rice syrup. Many manufacturers use refined sugars as they’re cheaper than lactose. However, refined sugars can cause rapid weight gain and lead to obesity in infants. Beta carotene and ascorbic palmitate are the common synthetic preservatives used in baby formulas. Several other neurotoxic nutrients such as lycopene, lutein, nucleotides, l-methionine, 1-carnitine, and taurine are added to baby formulas. While you may not find them in European baby formulas, some U.S. baby formulas tested for the presence of these synthetic nutrients failed the test. Other ingredients that can cause issues such as constipation, gas, bloating, etc., are Soy and Palm Oil. Lebenswert baby formula is available in different stages for babies belonging to different age groups. The brand follows strict practices of biodynamic agriculture and is certified in Biodynamic Farming. This simply means that the animals, land, and farmers involved in the production of the baby formula are treated with care and respect by striking a balance between the community and environment. The result is a high-quality baby formula that has been certified organic and follows the guidelines drafted by the Bioland Association. Lebenswert Stage 1 Organic Formula is a great alternative for breast milk. It can also be used as an addition to breastfeeding. Babies typically readily accept the change from breast milk to Lebenswert baby formula. You can use Lebenswert formula for feeding your infant using a feeding bottle or add it to Holle Wholegrain Porridges. The formula is gluten-free, easy to digest, and does not contain any added sugar. The formula can be prepared easily by using the scoop included in the product packaging. If you want to hit accurate ratios, make sure you use only the scoop provided with the baby formula. Add 1 scoop for every 1 ounce of water. Does not contain maltodextrin or other added sugars. Suitable for newborn babies and infant up to 6 months. Suitable for feeding through a feeding bottle. Cultivated from farms that meet stringent guidelines drafted by the Bioland Association. Contains high-quality ingredients and raw materials. Does not contain any synthetic nitrogen fertilizers or pesticides. The baby formula contains only lactose as a natural sweetener and carbohydrate. It does not contain any starch or maltodextrin. The baby formula does not contain any unnecessary chemicals or additives. Cows are raised in open-fields and not treated with any hormones or antibiotics. The baby formula does not contain peanut, wheat, or soy. The resulting mixture is light on the baby’s stomach. The baby formula is a great replacement for breast milk. The baby formula does not cause gas, bloating, and constipation. Since Lebenswert baby formula comes in different stages for babies for different age groups, you need to keep switching the product with the growing age of your infant. The baby formula contains Palm Oil which some parents don’t prefer. Full Review Read our full Lebenswert Formula review for more details. Many parents who were feeding their babies U.S. baby formulas have switched to Lebenswert which is an EU baby formula. Their babies are simply loving the product. From Free Delivery to the amazing taste of Lebenswert Baby Formula, parents are simply in awe of all the great things about the baby formula. Parents who’ve used other baby formulas have mentioned that Lebenswert Baby Formula looks, smells, and tastes like breast milk. Many babies who refuse breast milk are readily accepting Lebenswert Baby Formula because of its taste and texture. Many babies suffering from digestive problems are constipation and indigestion free since they started consuming Lebenswert Baby Formula. Hipp Combiotic First Infant Organic Formula comes with all the essential nutrients a baby needs to grow healthy and strong. The best thing about Hipps Organic Infant Formula is that it’s loaded with probiotics and prebiotics. While adults can provide the intestines with healthy bacteria by consuming foods such as sauerkraut and yogurt, babies require the support of prebiotics and probiotics to ensure proper functioning of their digestive system and maintain gut health. The milk formula is suitable for a newborn as well as up to 6-month old babies. You can introduce Hipp First Infant Organic Formula as soon as your baby is born. It contains vital Omega-3 and Omega-6 fatty acids among several other nutrients important for your baby’s health and development. Moreover, the protein levels in this formula have also been altered to meet the findings of nutritional studies. The primary ingredient in the formula is skim milk. 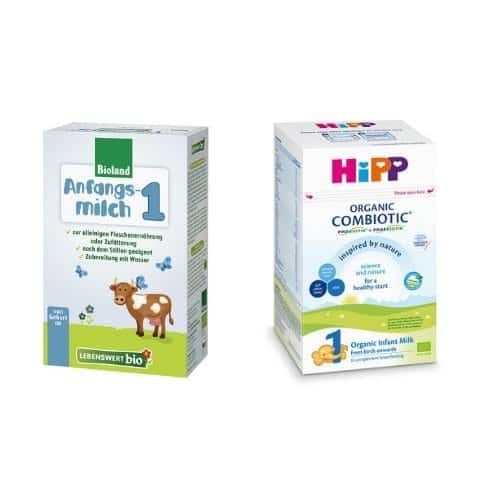 Therefore, Hipp Combiotic First Infant Organic Formula is an authentic dairy product and is derived from healthy cows. Make sure you follow the preparation and feeding instructions mentioned on the box. Also, before using the product, make sure you wash your hands as milk powders are not sterile. Boil running water and allow it to cool for some time. Use only natural boiled water. Avoid using any artificially boiled water. Then add the required amount of water to the feeding bottle. Using the scoop included in the product package, add 1 scoop baby formula for 1 ounce of water. Place the teat and cap of the bottle and shake the bottle to mix well. Do not make the mixture stronger or weaker than required. Also, do not mix the milk formula with any other product. If you notice any inconsistency in your infant’s stool, don’t get hassled. Since Hipp Combiotic First Infant Organic Formula contains prebiotic in the form of oligosaccharides, it may change your baby’s stools similar to the stools of breastfed infants. Suitable for newborn infants till they turn 6 months old. Contains Omega-3 and Omega-6 fatty acids, prebiotics, probiotics, Vitamin A, Vitamin B6, Vitamin C, Vitamin D, Vitamin E, and Vitamin K for healthy growth and development of your baby. Contains organic lactose for natural sweetening. Suitable replacement for breast milk. The baby formula is gentler on the infant’s stomach than other baby formulas on the market. The baby formula is certified organic. You can use the product as a substitute for breast milk or in addition to breastfeeding. The baby formula does not contain any processed refine sugar. Some Hipp formulas have been reported to have traces of aluminum. However, the quantity was minute, and there is no proof till date that it can harm babies. The baby formula contains LCP oils which some parent don’t prefer. The baby formula contains Palm Oil that is usually found in soaps. ARA and DHA present in Hipp Baby Formula are extracted using hexane, a neurotoxin which can be harmful for your baby. Many parents are highly satisfied with the texture, taste, and smell on Hipp Combiotic First Infant Organic Formula. Babies could hardly spot any difference in the look and taste of breast milk and Hipp Baby Formula. Some new moms and dads have mentioned that their babies do not suffer from constipation and issues such as bloating and gas anymore. Hipp Combiotic First Infant Organic Formula keeps their baby’s gut healthy. Parents who found it difficult to mix another baby formula thoroughly are happy with Hipp Combiotic First Infant Organic Formula. It mixes well and does not become very bubbly. Moreover, the powder is lightweight and dissolves almost instantly. No clumping or sticking has been noticed on the sides of the feeding bottle. On top of everything, parents prefer this baby formula as it’s not harmful in any way. Even though Lebenswert and Hipp Baby Formula have many similarities, upon further review in the Lebenswert vs. Hipp comparison, we found out that each infant formula has something special for babies. However, Lebenswert Stage 1 Organic Formula is a stronger contender here. It does not contain any unnecessary ingredients or added sugar. Even though Hipp Combiotic First Infant Organic Formula comes with all the essential minerals, vitamins, fatty acids, probiotics, and more, for healthy growth and development of your baby, it contains traces of metals such as aluminum and oils that are not found in Lebenswert Baby Formula. Also, DHA and ARA present in Hipp Combiotic First Infant Organic Formula are extracted using hexane, a neurotoxic chemical compound. Even though the brand claims that hexane is completely removed after extraction and cannot be detected in Hipp baby formulas. Biodynamic Farming involved in the case of Lebenswert Formula beats everything else. It means that no synthetic chemicals or fertilizers have been used during the production of the baby formula. Everything that goes into Lebenswert Baby Formula is organic. So, all in all, Lebenswert is a high-quality product that’s entirely pure and nutritious. Yes, Hipp formula is hypoallergenic. If your baby’s stomach is sensitive, Hipp Combiotic First Infant Organic Formula can be a good option. Combiotic formula milk is organic, and it contains essential vitamins, minerals, Omega-3 and Omega-6 fatty acids, prebiotics, and probiotics in the form of oligosaccharides required by babies to grow strong and healthy. Does Lebenswert formula contain maltodextrin? No, Lebenswert formula does not contain maltodextrin. For sweetening, it contains lactose which is a natural carbohydrate. How long can I store Lebenswert formula outside? Do not keep the feeding bottle containing the mixture outside for over 2 hours. After 2 hours, store the bottle inside your refrigerator and use it within 24 hours. Can I add sugar to Lebenswert and Hipp baby formula? Yes, you can. However, it’s not a healthy choice for your baby. Brands use lactose instead of maltodextrin and sugar syrup so that your baby doesn’t gain weight rapidly. If your baby likes the taste, you can add sugar. Also, most of the baby formulas on the market are already sweetened. What Does HiPP Stand For? HiPP is named after the family in Germany who started the brand, along with their family farm and mill started by Joseph Hipp over 100 years ago. As you’ve seen in the Lebenswert vs. Hipp comparison here, Lebenswert is a better choice. However, before you pick one of the options, make sure you know the exact requirements of your baby, existing food allergies they have, and other digestive issues they’re suffering from such as constipation, bloating, gas, etc. You can combine both the baby formulas and use them on alternate days. Before you begin using either of the options or both regularly, go for trial and error. Both products are certified organic and resemble breast milk. If you want, you can even check with your pediatrician and seek their advice. Nevertheless, as a new mom or dad, you’re the best judge for your baby. 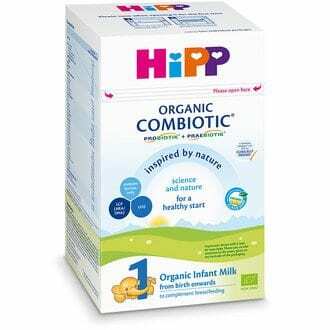 If you’re really interested in feeding your baby a milk formula that contains prebiotics and probiotics, Hipp Combiotic First Infant Organic Formula would be an ideal choice. Here, the big question is picking the best option between Lebenswert vs. Hipp, and we hope we’ve helped you pick the best option for your baby. Personally, we feel that Lebenswert is better than Hipp. It’s less expensive and more reliable than Hipp. No matter which product you choose, you can rest assured that you’re purchasing a product that’s superior-quality, organic, and safe for your baby. If you have any other baby food products in mind that you would like us to review, you can let us know, and we’ll get working. Also, if you have any more questions related to either of the brands mentioned in this comparison, you can post your questions in the comment section below. While you won’t find these in supermarkets or even most specialty stores / health food stores, you can find them online. In recent years the reliability, pricing, and selection for European formulas has dramatically increased online. Lebenswert on BuyOrganicFormula.com: Typically the best pricing, you can also save 5% with our code BABYSWAG5 at checkout. Lebenswert on BabykindMarket.com: Another great place to buy and offering a special $5 off coupon with your first order (use code BABYKIND-TBS at checkout). Lebenswert on Formuland.com: Sometimes available in bulk discounts. Lebenswert on OrganicStart.com: Also offers bulk discounts. Hipp on BuyOrganicFormula.com: Also great pricing and features different countries of origin in Europe, if you have a preference. BABYSWAG5 discount of 5% also applies. Hipp on BabykindMarket.com: The same deal applies, just use code BABYKIND-TBS at checkout to automatically take $5 off of your order. Hipp on Formuland.com: Sometimes has better pricing, depending on the country of origin. Doula vs Midwife – Which One Is Right for You?